It's about this time of year when many people start thinking about thanksgiving. We don't celebrate thanksgiving, but I previously tried this recipe for a dinner party with friends and it worked so well that I wanted to try it again and make sure I posted it in time for thanksgiving if it worked out. It's not very difficult to make either which means it's a winner in my books! Peel and de-seed the pumpkin. Cut into pieces and cook until tender however you choose, my preferred way is in the microwave. This takes approx 7 mins with a small amount of water in the bottom of a microwave safe dish. You need 1 1/2 cups of cooked pumpkin pieces, though don't stress if you are a little over or under as this recipe is very forgiving. 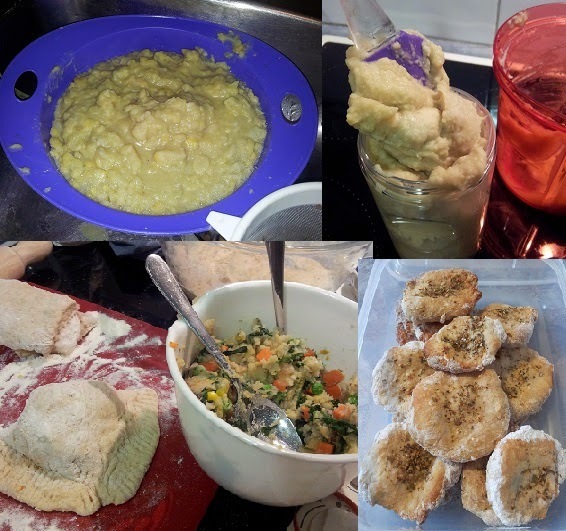 In a food processor combine the crust ingredients and pulse until the mixture is lightly crumbled and comes together. Press the mixture into the pie dish with the back of a spoon. You can be as precise or rustic as you desire. Make sure there are no holes in the button layer as the filling will leak through if there is. Place pie base in a preheated 160°C oven and baked for 20 minutes. Make sure the pumpkin is well strained of any water. Strain the tofu. Combine all the filling ingredients in a food processor and blend until very smooth. Pour the filling over the baked pie base. Spread with the back of a spoon to get a nice even surface on top. Return to the oven and bake for a further 40 minutes, still at 160°c. Once cooker, remove from the oven and allow to cool completely before slicing. * We have found that so long as we are using a glass pie dish it doesn't need to be sprayed with oil, the pie slides right off it when it's cooled. 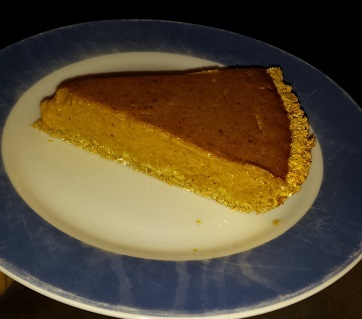 * This is a lightly sweetened pie, you can use more maple syrup if you'd like a sweeter pie. There are very few recipes I make these days that inspire me enough to blog post! The truth is we are eating so simple and repeat many of our favourite meals over and over. We don't get bored of them and they are always super delicious. This recipe is one that I have been making for many years, but recently seeing all the beautiful Australian asparagus I just KNEW it was time to finally post this (the pictures were taken 2 years ago)! As much as possible we try to buy only Australian produce which means that our time line for eating asparagus is rather short! So for those readers who are in Australia make the most of this one, and for those in other countries - be sure to let me know how often you get to enjoy asparagus! This meal is a super quick one. It's so easy that no matter how busy your day has been or what time of night you get home, its totally do-able! We often have cooked grains in our fridge, and there's rarely a week that goes by when we don't have a big tub of cooked brown rice in there. It's a great time-saver to have whole grains precooked. Growing up my father loved tinned asparagus! Personally, I never saw the appeal so I always thought I didn't like asparagus. But as a "grown-up" I decided to re-try it and discovered that having it fresh really tastes like a whole different vegetable! I have grown to not only enjoy, but totally LOVE fresh asparagus (and I still don't see the appeal in the tinned stuff!!!!!!!!!!!!). I am showing serving size for one person, however it's really easy to make this for as many as needs be. The flavours work so well together and it feels like a real treat. In fact, it's not too far off what we seem to be served at functions! Slice the mushrooms into long thin strips. Remove the woody ends from the asparagus. Over high heat in a non-stick pan add the asparagus spears, the mushrooms, crushed garlic and lemon juice. Allow to saute, occasionally stirring gently, until the asparagus is just tender and the mushrooms are slightly wilted. While the asparagus mixture cooks, warm the rice either in a microwave or on the stove top. Once warmed, stir through the salsa. Yes it really is that simple to have a delicious and nutritious meal in minutes!!! What time of year do you get locally grown asparagus? Do you like the taste of asparagus either fresh or tinned? For those of you who make your own motherless milk, it can often be quite a dilemma what to do with all the leftover pulp. It seems wasteful to throw it away, and yet it isn't always the easiest thing to find uses for, especially if you go through a lot of milk in your home. Here's a great way to use up some of that pulp. I have only tried this pie with okara (soy milk pulp) but I see no reason why it wouldn't work with other plant-based milk pulps. Put all ingredients in a food processor and pulse a few times until combined. Mixture will be a wet crumble. Press into a 20cm pie dish, making sure to press some of the mixture up onto the sides. Bake for 12-15 minutes in a preheated 180C oven. Combine all the pie filling ingredients in a food processor or blender and mix until smooth. Pour mixture over the baked pie crust. Cook at 160C for 1 hour. Remove from oven. The mixture will be slightly wobbly. Allow to cool prior to slicing. The mixture will thicken upon cooling. Serve with frozen berries of choice. Do you make your own plant-based milk? If so, what do you do with the pulp? Have you seen mini kale in your supermarket or farmers market lately? I have found these little kales in Coles, and not only are they super cute, but they are really delicious too. They don't have the same grassy taste that regular kale does. They have a subtle sweetness to them. We have been enjoying them the last few months. They are called "kalettes" and Coles has described them as a combination of kale and brussels sprouts with a nutty flavour. I think that is a very good description. Place the quinoa in a microwave safe dish with 2 cups of water. Place a lid on and cook in the microwave for 12 minutes or until quinoa is clear and cooked through. Remove the woody ends from the kalettes and steam for 3-4 minutes. 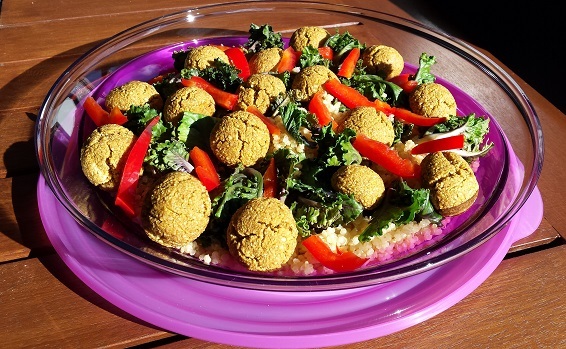 Combine all the above in a salad bowl along with the falafels. To make the dressing, simply combine all the ingredients in a blender with 2-3 Tablespoons of water and blend til smooth. You can add more water if you prefer a thinner sauce. *You can use regular kale if you can't find kalettes. Just steam and chop into rough pieces. Have you seen kalettes in the shop? Life has been very busy for me lately - this is reflected in my lack of posts! I hope to be more motivated soon and share all the drafts that I have lined up waiting to be published. These "sausage" rolls were inspiration enough to get me started back at it again. They are super easy to make and they are very delicious. Drain the lentils and combine them in a bowl with all the other ingredients except for the pastry. Mash until the lentils have crumbled and the mixture resembles mince. Place a quarter of the mixture onto the side-middle of 2 sheets of filo pastry. Fold the side of the filo pastry in, then fold the edges up and roll until you reach the end of the pastry. Repeat for the other 3 rolls. Place on a lined baking tray and brush the tops with soymilk. Bake in a 180C oven for 20 minutes until golden brown. Best served while still hot from the oven. I am totally in love with these mini capsicums that are readily available in the grocery store lately. There's something about the mixture of the colours and their little cone shapes that I just find incredibly appealing! Here's our families favourite way of using them lately. This makes a great side dish. Half the capsicums and scrape out the seeds. Place in a baking dish along with the cauliflower broken into florets. In a microwavable measuring jug, combine the remaining ingredients and stir with a fork until dissolved. Microwave for 1 minute until the mixture starts to thicken. Place in a preheated 200C oven for 40 minutes until veggies have softened and lightly browned. Are mini capsicums available in your area? Do you use them as mini scoops for anything? These are a delicious, sugar fee, oil-free, yet moist muffin. They are easy to make and we often prepare them the day before if we will be staying somewhere overnight and want a quick and easy breakfast. My husband always said he didn't like blueberry muffins..... now he LOVES them! In a large mixing bowl combine the oats, flour, baking powder, flax seeds and cinnamon. 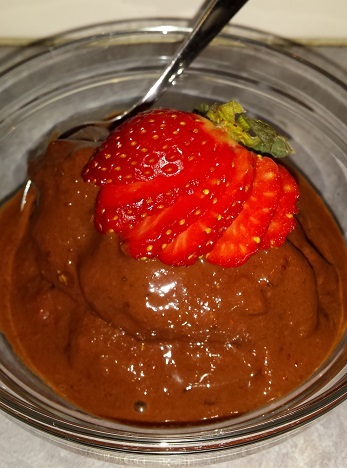 Place the drained dates, milk, and vanilla in a blender and blend til smooth. Pour the wet ingredients into the dry ingredients. Stir til combined. Add the blueberries and fold through the batter gently. Pour into a lined or lightly sprayed jumbo muffin tin. Top with crumbled walnuts if desired. Place in a preheated 180C oven for 25-30 muffins until cooked through. What's your favourite muffin flavour? Brace yourself --> I bring you fabulous news!!! It is possible to make delicious Corn Chips that haven't been deep fried! Layer half a can of creamed corn onto a lined dehydrator tray. Dehydrate for 8-10 hours, time will vary depending on your dehydrator. You can tell when it is done as the colour will have changed completely and the corn will be crisp. Note: You can stir into the corn some paprika or taco flavoured spices if you desire. Gently pull the lining away from the corn crisps, being careful not to split them. Using a large knife, slice into pieces (or you can do it with your hands if you'd rather!). Yes, it's really that simple! The hardest part is waiting for the dehydrator whilst a delicious aroma fills your home! Now for a perfectly paired dip. Mix a can of re-fried beans with 1/4 cup diced tomatoes (either canned or freshly chopped). Stir until the re-fried beans are now more spreadable. Pour bean mix into a serving container. Chop 1/2 red capsicum into little pieces, sprinkle over the top of the dip along with 1/2 can drained corn kernels and 1 chopped spring onion. You can put a dollop of salsa in the middle if you like for presentation purposes. Would you like an invite to our home for pre-dinner snacks??? For those of you who follow my blog, you may have noticed I have taken a bit of a break lately. We have lots going on for us so I just needed some down time, and that meant time away from the computer. 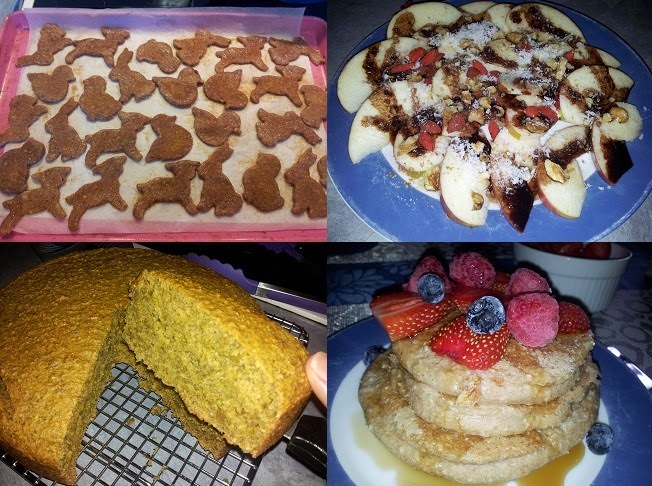 I have plenty of recipes lined up to share in the coming weeks, but to get back into things I thought it would be a good idea to share what has been happening In My Kitchen so far this year. When life gets busy we find that we fall back onto easy meals. Well, to be perfectly honest the large majority of what we eat is easy, basic meals. But in busy times that means relying on some family favourites. Red Lentil and Spinach Sauce with roasted potatoes and green beans, Veggie Pizza, mashed potatoes with steamed veggies and thick Mushroom Gravy with spinach added, Salad with Potato Waffles and Lentil Burgers, Red Lentil and Spinach Loaf with corn and potatoes, Rice & Veggie Bake, Eggplant Bean Sauce over roasted potatoes with corn, Lentil Meatballs with potatoes in tomato sauce and steamed veggies. 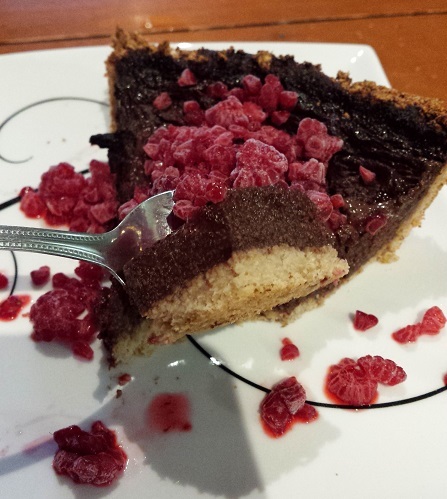 Easy doesn't mean that dessert is forgotten! 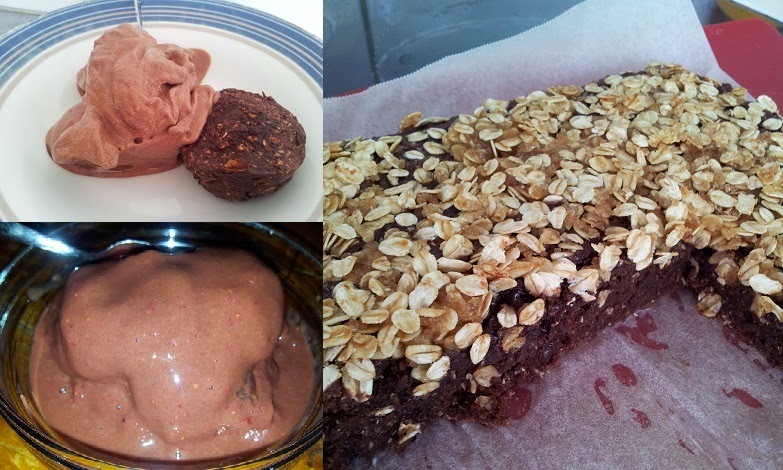 We often have banana ice-cream, or mini "puddings" that are made with just fruit, dates, applesauce and oats. I often throw together things like this without following a recipe. However when I made these raisin sweetened brownies my family gave me strict instructions to write down exactly what I had done and make them again and again! Recipe coming soon so stay tuned! Below is a new family favourite that we are working out how to tweak it to be just right. The problem is, I have been slack with writing down exactly what I do, so no 2 batches ever end up the same! But this is so good that my husband has made up a little song to go with it! They are just so inviting! I have been putting our pressure cooker to good use and making large batches of legumes. Sometimes though...... it all goes horribly wrong! I find that I am still getting used to the exact number of 'minutes' that I should set the cooker to, in order to get perfect legumes. This batch of fava beans that I put on were clearly overdone and they had completely crumbled into a big blob! So instead of being able to use them in a ratatouille like I had planned, I ended up doing some experimenting! I must admit that it brings me much joy to just experiment in my kitchen and not have to bother with precise measurements! I made several dips and a batch of mini pita breads to go with them. I took this into work for a meeting and everyone really loved both the dip and the pita bread. These stuffed foldovers were loved by my family too. 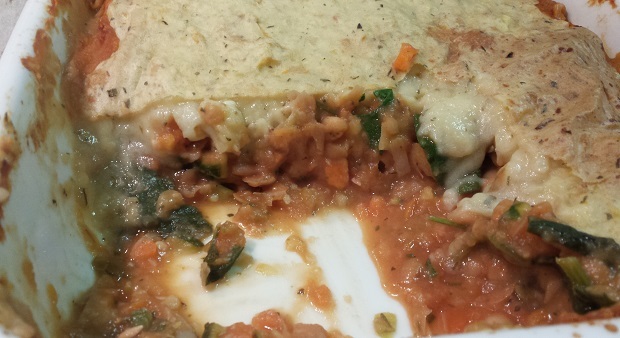 They were filled with the gone-wrong fava beans, spinach, carrots, peas and corn. Of course, baked til golden brown (not shown). Talking about baking, there is rarely a week that goes past without our oven producing wonderful aromas. We made these animal cookies for a "vegan teddy bears picnic" we went to. They had a wonderful texture, quite true to 'cookies' even without the use of vegan butter replacements. I intend to master this creation and blog the recipe soon. However, since they do contain nuts, it is a rare occasion that we eat nuts at home so it may be a while before a final recipe eventuates! The "kale" cake shown is the recipe from the new Prevent and Reverse Heart Disease Cookbook, which I finally caved in and purchased! Also shown below is a pile of super yummy oat pancakes which we devoured for breakfast one morning. And one of my daughter's favourite after school snacks recently - apple nachos. Sliced apples, piled with goji berries, homemade chocolate sauce, coconut and a sprinkling of walnuts. More colourful items. She is really enjoying hommus and salad wraps/rolls at the moment. Pictured is also pita bread, banana loaf, fruit wrap and strawberries. 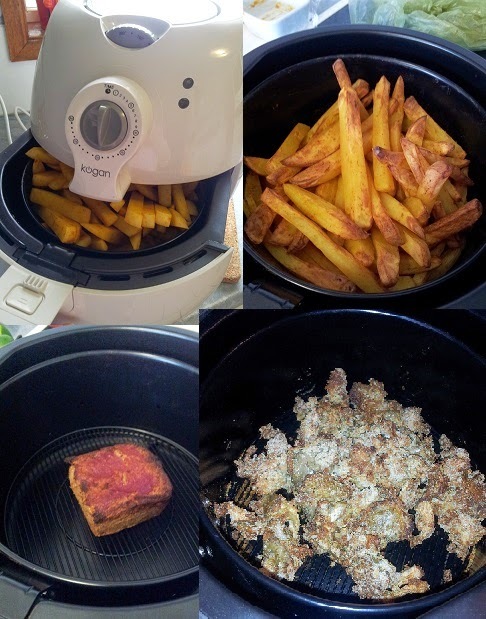 I bought a new gadget recently - an air-fryer! I am in love with it! Not only does it NOT totally heat the whole house up (like the oven does) but it cooks my potato chips in less than half the time. It is also great for warming up leftovers for school lunchboxes and also makes wonderful crumbed mushrooms (even if the photo looks wrong, I promise you they were delicious! I used oyster mushrooms on this occasion). 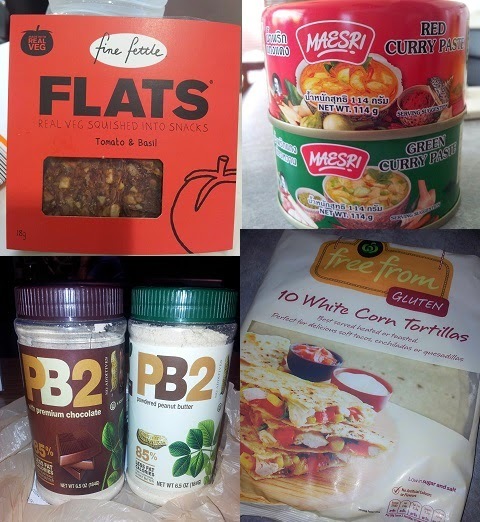 PB2 (Powdered Peanut Butter)- Yes, yes I know - processed food! But alas, I just HAD to try this when I saw it in our health food store recently. And with much less fat than peanut butter it ticks the box for an occasional treat. I bought these curry paste's to try and they are the only oil-free ones I could find. I have only opened the red one so far and it was HOT HOT HOT! So the other three-quarters of the container is still in the fridge! These relatively new "flats" - available in Woolies and other stores, are made from veggies or fruit with the addition of seeds and/or nuts. They are dehydrated to become crispy. They are quite tasty. Again, not something I would purchase regularly but none the less a great product for when those occasions happen that we need something to snack on and are caught out unprepared (I'm thinking those days when you end up caught back at work for 2 hours!). Also shown are these White Corn Tortillas. I pictured these because I have been asked about wraps that are oil-free. These are the only ones that I have had any luck being able to find regularly. 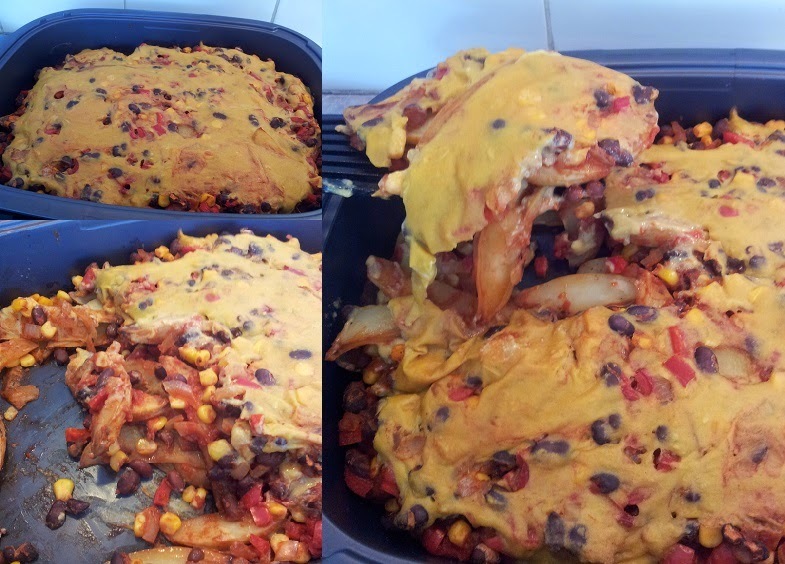 To be honest, they don't fold real well and are best used in cooked items such as Mexican Pie. And to finish off this post - here a few items "out" of my kitchen. 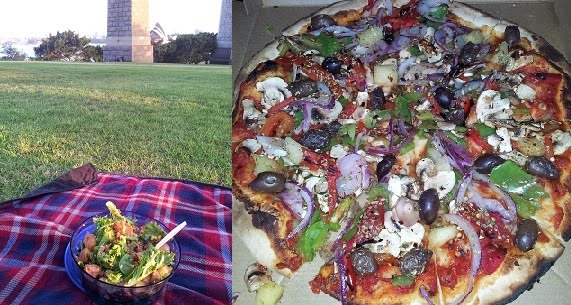 Enjoying a delicious Bean & Potato Salad under the Harbour Bridge just before day-light saving ended. It's nice to stop and enjoy the little blessings when life gets busy and the weight of everyday things are getting us down! What is something that you can stop and be thankful for lately?